The large scale HADES Experiment at GSI uses drift chambers for particle tracking purposes. In order to monitor the gas pressure of the filling gas the MDC Gas Monitor NIM module has been developed. It serves primarily as an interlock for the high voltage in case the pressure is out of its working range. For the remote controlling and monitoring of the pressure, of the interlocks thresholds and of several temperatures of critical electronic components the general purpose board HADControl (aka HADSHOPOMO) is used. This board, designed and developed by the EE department of GSI (M.Traxler) is based on the ETRAX single chip computer by AXIS running Linux. lower and upper threshold settings for the interlock for the HV supply, which reacts on the gas pressure. For this purpose the results of several projects of the EPICS and HADES groups at GSI are used. ... more see Project page for details. Besides the Threshold setting and Temperature/Voltage/Current Monitoring the RPC (resistive plate chamber) detector of HADES requires EPICS based monitoring of their gas system parameters. The data of the gas system are retrieved by a proprietary hardware controller controlling/monitoring flow (set/get), and (differential) pressure (get). It is accessible via CANbus. This CANbus is connected to a HADcon(trol) general purpose board, where an EPICS Server is running. 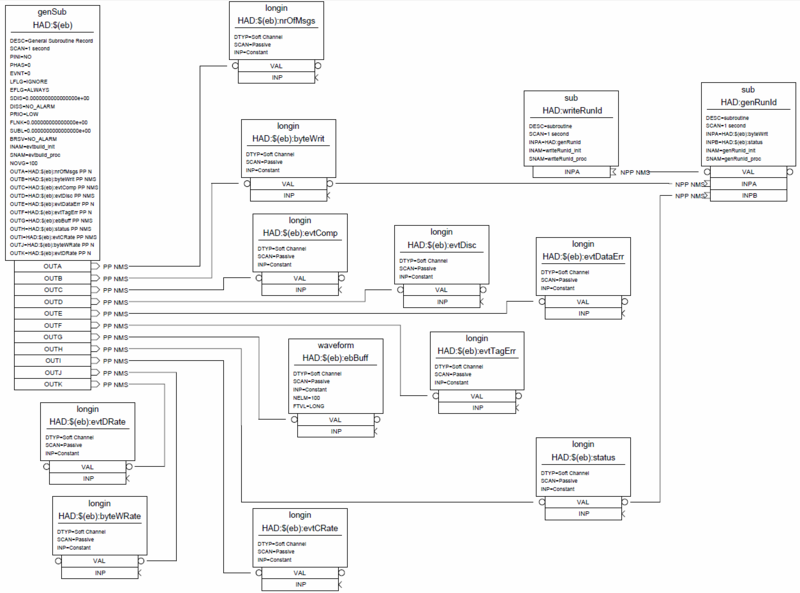 This IOC collects the data provided by the HADcon's microcontroller via the streamDevice protocol and provides them to EPICS clients such as a CSS based BOY GUI build for this purpose. Using the port folio of HadCon based applications the objective of this project is to realize a reading of several hall sensor values to be available inside HADES EPICS based control system. For this application 2 sensors are planned which feed separate 1-wire buses. The HADES data acquisition system is based on the trbnet architecture. 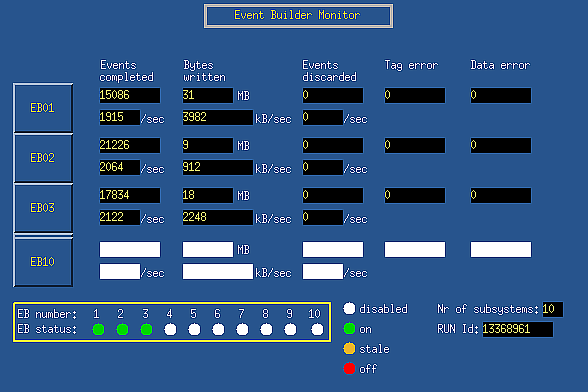 Its status and controls are accessed via the command (shell,library) trbnet. Up to now its (ASCII) output is efficiently parsed by perl routines and displayed in an ASCII view or forwarded to gnu-plot. Those plots are dynamically created depending on the data return of trbnet and its dynamic configuration. In view of an integration of at least the monitoring features into the already used EPICS system at HADES this data flow should be extended/replaced. Starting within the HADES project, an EPICS application for the readout of the CTU (central trigger unit) has been built by Burkhard Kolb. This EPICS IOC connects to the " trbnet command server" and, reads and writes array blocks of information, using the libtrbnet library into EPICS asub records. In a second step, up-to-now: integrated, but to be disentangled in future, the CTU specific information is derived by breaking the information down into single units of information by properly decoding the basic information. When writing this information has to be combined before writing again to the trbnet. In order to connect to the MBS status port an IOC was programmed by Jörn Adamczewski. A medm user interface is available from Hans Essel. The FOPI experiment at GSI is/was(?) 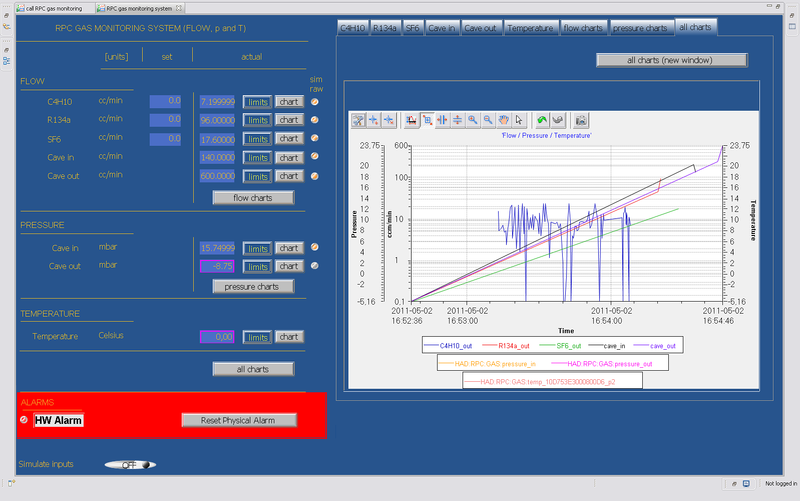 using this interface to monitor the status of its MBS experiment.